For your hay rake needs, Holt Ag Solutions offers you Pequea Hay Rakes. 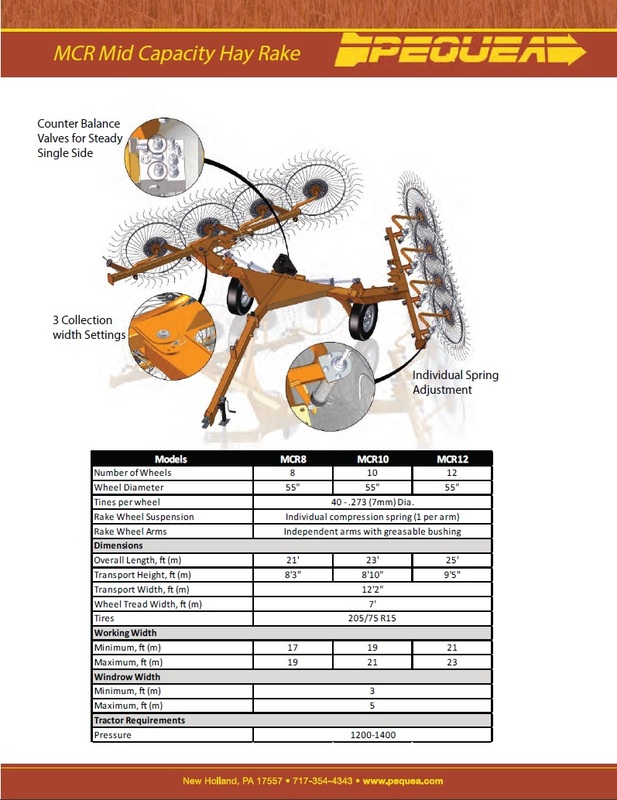 Pequea offers Rotary Rakes, Carted Rakes and the overhead frame, ground driven wheel rake, the Windrow Pro. With several models to choose from, we are sure we can find the Pequea Rotary Rake perfect for your needs and applications. Pequea rotary rakes feature clean sweep raking widths ranging between 9' to 24', you will get the most from your hay crop efficiently. Each Pequea Rotary Rake features a hydraulic lift system and adjustable height to ease fieldwork and maximize maneuverability. The adjustable front cylinder allows users to fine tune pitch and all Pequea Rotary Rakes feature removable tine arms. Pequea Tandem Rotary Rakes allow you to rake either two separate or one combined windrow to serve most bailing or chopping applications. All are designed to last, are highly adaptable and versatile. Pequea’s Mid-Capacity Rake (MCR) is a highly adaptable carted-stype wheel rake. Capable of raking in almost any condition or terrain, the MCR comes standard with individual wheel suspension and windrow width adjustments. The MCD is a modular design, providing you with versatility and efficiency with it’s ability to easily go from an 8-wheel rake to a 10-wheel rake, even up to a 12-wheel hay rake. The MCR can also be built with such options as single-sided raking, a kicker wheel or a hydraulic wheel, for when you require more precision. One of the best valued wheel rakes on the market, Pequea's Windrow Pro™ have a higher capacity for quick raking without compromising hay quality. You can rake up to 29 feet of hay into a single windrow with these wheel hay rakes which combine extensive standard features with Pequea’s impeccable quality.